The Italian newspaper, Il Messaggero, is currently running a poster advertising campaign with this mock front page headline, "Roma brucia. Nerone: 'Non c'entro.'" Translated, it means, "Rome burns. Nero: "I have nothing to do with it." Helpfully, next to the headline, there is a "photograph" of Rome on fire. It all looks very authentic, the paper's aim to show how events of the past might appear if reported by a newspaper today. But change the name from that of the Roman emperor to Silvio Berlusconi, and it might also serve as a useful depiction of what is happening in Italy now. The current political firestorm has the prime minister at its centre and, like Nero, he is claiming he has done no wrong. But, also like Nero, Mr Berlusconi might come to meet an untimely end. That is because his fate is about to be decided by confidence motions in Italy's lower and upper houses of parliament, the Chamber of Deputies and Senate. If he loses in either on 14 December, it could be night-night Knight ("Il Cavaliere" is the name by which some refer to Mr Berlusconi). It is hard to pick one event, one incident, which has led to this moment, there have been so many. But, for argument's sake, let us choose 28 April 2009. That was the day Mr Berlusconi's estranged wife, Veronica Lario, wrote an open letter to the world complaining about his behaviour with and attitude toward young women. He "consorts with minors", said Ms Lario, in one of her more memorably lethal phrases. It is quite possible that historians will conclude that the rot set in from there. Before that, things had been going pretty well for the prime minister. Ok, Mr Berlusconi may have been facing outstanding charges of bribery and corruption, but such matters had always been a boomerang problem during his long political life. Generally, life could not have been going better for him. The same month his wife's letter arrived saw him tackle the aftermath of the L'Aquila earthquake. His decisive and timely personal intervention helped avert an even worse disaster. What former US President George W Bush did wrong with New Orleans after Hurricane Katrina, Mr Berlusconi did right with L'Aquila. It will probably be seen as the high-water mark of his premiership. But there were other accomplishments, as well. He played a key role in rescuing the state airline, Alitalia; helped solve the Naples rubbish crisis (though the sequel to that has since come back to haunt him); and reached a deal with Libya to turn a torrent of illegal migrants from North Africa into a trickle (albeit at the cost of widespread condemnation from organisations ranging from the UN to the Roman Catholic Church). In politics, too, he did what few Italian leaders had ever done - uniting the Right to create what amounted to a two-party system. Gone, so it seemed, was the fractious, multi-party, revolving-door politics that characterised post-war Italy, a country which has experienced, or endured, more than 60 governments since 1945. The potential made some heady with the allure of achievable ambition. Supporters put his name forward for the Nobel Peace Prize, for the efforts he made in seeking an end to the 2008 conflict between Georgia and Russia. There was talk of his statesmanship, even his legacy. But then, slowly, the mood changed. Was it the comment about US President Barack Obama's "tan" that did it? Was it his time-sapping energy devoted to justice reform, which handily kept his own cases out of court? Was it Noemi Letizia, Patrizia D'Addario or Barbara Monreale, the young and not-so-young women who have been "entertained" by the 74-year-old billionaire and then ended up in the papers? Was it his ill-judged attempt to lean on the Italian police to get a 17-year-old Moroccan girl, known as Ruby, released from custody by claiming she was the grand-daughter of President Hosni Mubarak of Egypt? Was it his quip that it was "better to be passionate about beautiful women than to be gay"? Was it his foreign policy that placed relations with the likes of Libya's Muammar Gaddafi and Russia's Vladimir Putin above those with Italy's Nato and European Union allies? Has it been the drift that has set in, with little or no major legislation passed to solve Italy's chronic problems with healthcare, pensions and labour reforms? Or, has it been the profound sense of missed opportunity during his third term in office? In truth, there has been a bagful of tipping points, trickling out over the past 18 months, slowly corroding Mr Berlusconi's authority, respectability and credibility, even among his increasingly jaded supporters. In the past week we have seen how US diplomats, in the classified cables published by Wikileaks, were less squeamish about spelling it out. 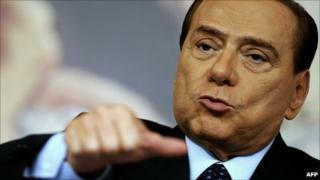 Mr Berlusconi, said one message, was "feckless, vain and ineffective". And that came from his "friends". It is why his popularity ratings are down to about 30% and why his position will be in jeopardy in next week's votes of confidence. It has come to this not because of some newly found unity and purpose by the centre-left opposition. Instead, it is because members of his own People of Freedom party have become fed up with him. Led by a one time neo-Fascist, Gianfranco Fini, they have set up their own party, Future and Freedom, and that has endangered Mr Berlusconi's premiership. But will they bring Mr Berlusconi down, or will he let them bring him down? With bond markets across Europe so nervous, Mr Fini has to make a very difficult calculation. Image caption What will Messrs Napolitano and Fini do? Does he go for broke and pull the rug from under Mr Berlusconi, risking creating chaos in the markets and plunging Italy into a crisis similar to those faced by Greece and Ireland, and with it earning himself the title of traitor? And will Mr Berlusconi have one last trick up his sleeve, whereby he gets through a vote in the Senate (as expected) and then goes to President Giorgio Napolitano to resign before the Chamber of Deputies votes? That way, he might be able to persuade the president to give him time to form a new administration. You would not put anything past this past master of survival. Think of any permutation, and in the cafes and bars of Rome and beyond they are being discussed to the nth degree by pundits, pollsters and politicians who thrive on this intoxicating brew of speculation and calculation. Nothing has so far dragged this astonishing political operator from power. Not being hit in the face with a replica of Milan cathedral; not the humiliation of his wife's open attacks; not the collective condemnation of most of the world's media; not the gaffes; not the allegations of sleaze. But a simple vote might, and in the aftermath of that Mr Berlusconi will need more than a fiddle as his own edifice goes up in smoke.